Everyone knows that lace-up boho sandals are all the rage nowadays. But we got news for you, the Romans conquered this stylish territory first! 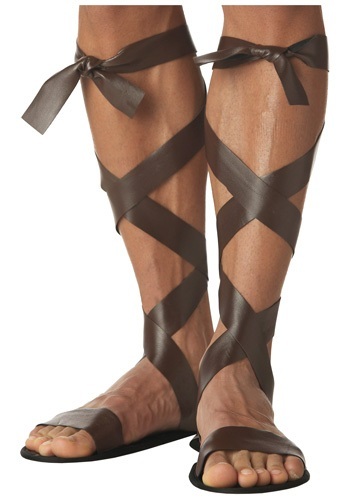 Why not add the timeless toughness of whimsical warrior essence to your toga costume or gladiator look with these brown Adult Roman Sandals? Enjoy the vision of them upon the floor of your chariot (read: Honda Civic) and revel in the way the rubber soles will help keep you upright no matter how chaotic the colosseum (read: Halloween party) are bound to become. Plus, you can show off all those calf raises you’ve been doing at the gym just by lacing this pair’s faux-leather straps up your--totally, impressively strong--legs. Let your classic look inspire Halloween empires far and wide this holiday; then, we recommend going home, unlacing these sandals, and slipping into a hot bath and soaking while you feed yourself plump, juicy grapes. Those Romans sure knew a few things about classic party looks and indulgent relaxation, eh? The sandals were pretty good just had to retie them a few times but that was kinda expected. Even a regular shoe untied. The sandals were very comfortable. It was like wearing a flip flop. I had no problem with these sandals. The sandals gave the costume even better character. The sandals were perfect for me cause I am flat feet anyway! It was a really good look, however straps wouldn't stay up and leather stretched where feet is at so feet started to slip out. Can't wear mulitple times. Good for one time use and not to be doing a lot of moving around. My husband said they were terribly uncomfortable and he could not wear them.